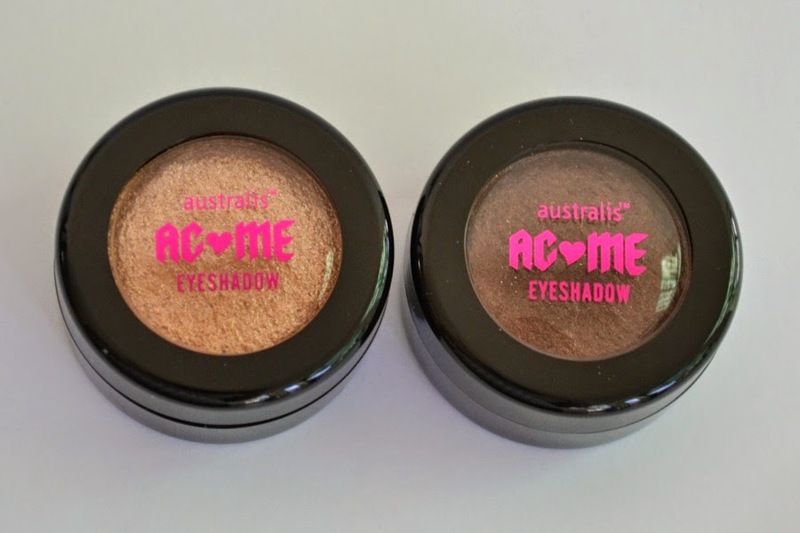 Bottled Beauty: Beauty On A Budget: Australis AC/ME Eyeshadow in "Plum Diddy" And "Bronzonce"
Beauty On A Budget: Australis AC/ME Eyeshadow in "Plum Diddy" And "Bronzonce"
If you're from Australia or read a lot of Australian beauty blogs then you would have heard about some of the great new products from Australis. A lot of beauties are hyping up the AC On Tour Contour & Highlighting Kit (seen here) as it's the drugstore/budget alternative to the Anastasia Contour Kit. There are 3 powder highlight colours and 3 powder contour colours. 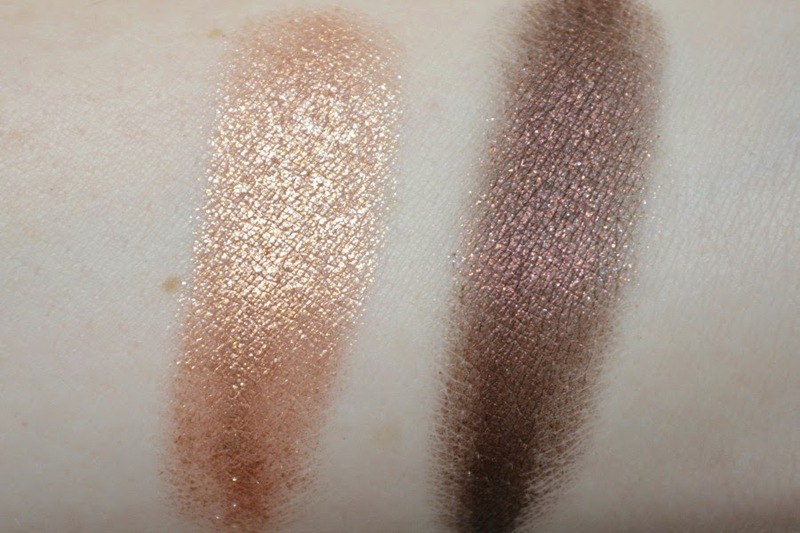 But for me the unsung hero has to be the AC/ME metallic foil finish eyeshadows. They're a cream shadow that has a similar texture to the Maybelline Bouncy Blush. I bought these at the Priceline near my parents house when I was visiting. I was in a HUGE hurry and didn't get to swatch them so I picked up two of the colours based on the colour I could see in the packaging. "Plum Diddy" (top swatch) is a gorgeous plum with brown undertones. It has glitter in it, but it's not overpowering. I've found when I use this on my eyes, it becomes more chocolatey black the more layers that I do. 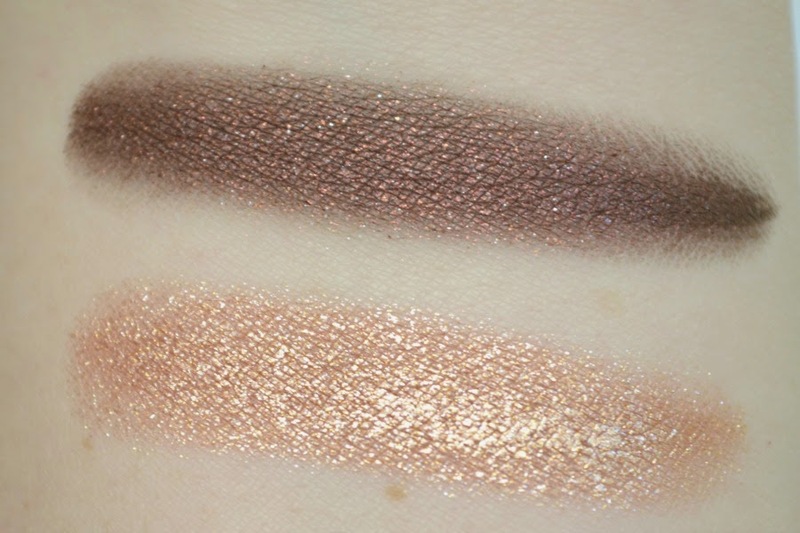 "Bronzonce" is a stunning rose gold shadow that really lives up to the "foil" claim. The first day I wore them, I applied it with my Rae Morris Creme Shadow Shader (brush 8.5) instead of my fingers. I've found that the "Bronzonce" has more of a impact and I don't need to build it up as much as "Plum Diddy." Because it's a "wet" formula, I ended up having my mascara smudge around my eyes. The next day that I used "Bronzonce," I set it with a powder eyeshadow. I used "Chopper" from the Naked 2 palette as they are very similar colours. I have also used "Half Baked" from the Naked 2 palette to set it too. This worked so much better and I didn't feel like my eyes were greasy or wet since the powder helped set it. If you have oily eyelids I would suggest setting these with either a eye primer or powder shadow. I haven't used a powder to set "Plum Diddy" as I need to go through my eyeshadows and find a similar colour to set it. The final colour available is called "Jay Zed" which looks like a golden shade with a khaki undertone. I tried to buy it from Priceline yesterday, but the store near my work had 3 of them... which were all testers!! I'll try again on Monday to pick it up. At only $7.95 each, they're inexpensive enough to get all 3 colours! Also available in the AC/ME range are 3 nail polishes (see here) and 3 Velourlips (see here). PS Both Priceline and Big W currently have a free clutch GWP when you spend $15 or more on Australis products. These looks beautiful! I have too many shadows that are similar to the rose gold one but I would consider picking up Plum Diddy it looks divine! You won't regret it!! It's soooo gorgeous. Aren't they the best!! Too bad that there aren't many affordable ones available. These remind me of stila's Magnificent Metals Foil Finish Eye Shadows :) especially Bronzonce (love the play on Beyonce) looking like Kitten from that range. Affordable dupes are always welcome in my collection. Thanks for the tip about applying a powder product over it!